We want their experiences to be as positive and stress-free as possible. That’s why we encourage parents to bring their children to our office before their scheduled appointment for a meet-and-greet with our team and a tour of our office. We’ll even show them our “magical” dental chairs and offer free toothbrushes and small toys. Your child’s oral health is very important—habits established now will last an entire lifetime. We have several options to help your child prevent cavities. These include sealants and fluoride varnishes. A sealant is a thin, protective coating placed on the back teeth (molars). While sealants don’t replace brushing and flossing, they can reduce the possibility of cavities by 80 percent. A fluoride varnish also helps prevent cavities by brushing a concentrated amount of fluoride on your child’s teeth to prevent cavities. Once again, this is not a substitute for brushing and flossing, but it does provide a distinct advantage. Your child’s health is precious. We want to be a part of your family’s health care team so we can keep your child’s teeth healthy and help ensure they won’t run into any problems later. Contact us so we can discuss the best possible treatments for your child. We’d love to meet you. Most traumatic dental injuries occur in children, especially in the 2-3 year old range when children are beginning to develop their motor coordination. We also see frequent injuries due to sports participation as children get a little older. Parents will want to contact our office right away following an injury to determine the severity and course of treatment. Basic types of injuries to teeth include chipped teeth, loosened teeth, and avulsed teeth. Chipped teeth account for the majority of all dental trauma. Since the course of treatment depends on the severity of the injury, you will want to contact our office for an evaluation appointment. In most cases we will want to schedule to see your child as soon as possible. Do try to bring any fractured pieces if at all possible. In many cases bonding can be done to restore the tooth back to it’s original shape and size. Loosened teeth that remain intact are the second most common type of trauma in children. This is also referred to as a concussion injury. Many of these teeth, especially in the primary dentition, will tighten back on their own but it is still important to contact our office right away for an evaluation appointment to make sure that the root is still intact. In cases of severe mobility or if the tooth is displaced, it may be necessary to splint the tooth for added stability. Avulsed teeth are teeth which have been completely dislodged from the mouth. If the tooth is a PRIMARY (or “baby”) tooth do not try to re-implant the tooth but call our office immediately for an evaluation. If the tooth is a PERMANENT or adult tooth, the first thirty minutes are crucial to a successful outcome. If possible gently rinse the tooth under water, but do not scrub the surface. Attempt to re-implant the tooth in the socket to the best of your ability. If this is impossible place the tooth in a glass of milk or in a clean wet cloth and contact our office immediately. In most cases of avulsion a root canal procedure will be necessary. For both loosened and avulsed teeth our office will need to monitor the tooth for signs of infection, including changes in color, pain, swelling or continued mobility. Follow-up x-rays will be required to watch for conditions not visible to the naked eye. Following dental trauma of any kind, please try to have your child eat a soft diet for approximately one week. Also be sure to avoid any hard foods or vigorous activity which may further traumatize the area. 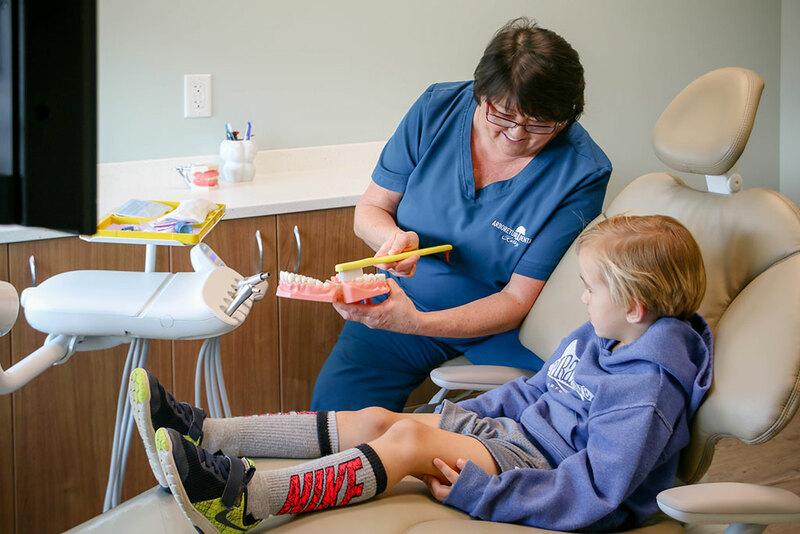 Rest assured that our team at Arboretum Dental is here to help guide parents through what can be a very stressful time for you and your child. When should my child have his or her first dentist appointment? Your child is typically ready for their first dental visit after their third birthday. During this first visit, we gently examine teeth and gums and may take X-rays to examine for tooth decay. X-rays also help us track the progress of permanent teeth so we can monitor their growth and development. We’ll also establish a schedule for future dental visits and ensure your child is receiving enough fluoride at home. Most importantly, we want to develop a positive relationship with your child. We never want your child to dread a dental visit! We provide our services in a calm, relaxing environment that’s popular with kids as well as adults! We are always available to answer any questions you—or your child—may have. Bring your child to our office. We’d love to meet your son or daughter! Seeing our office beforehand will help your child feel more comfortable on the day of the actual appointment. Utilize educational activities. The American Dental Association has lots of fun, age-appropriate coloring sheets and cartoons on its website. Your children can learn good dental hygiene from Dudley the Dinosaur and his friends, or complete activity sheets. It’s great reinforcement that learning about teeth can be fun! Show your child the virtual tour of our office. Be sure to speak positively about your own dental experiences. We’re glad to serve as a resource. If you know of anything we can do to make your little one feel more comfortable, we want to know! Please contact us with any questions. We want to set the foundation for your child to have a lifetime of good oral health. We accomplish that by working with you to prevent your child from getting cavities. We also use sealants, which are plastics that protect decay-prone back teeth by bonding to the chewing service. Limit sugar—a diet high in sugary foods causes cavities. Avoid sodas. Not only are sodas loaded with sugar, but they’re also acidic, which wears away tooth enamel. Encourage your child to brush and floss regularly. It’s an activity you can do together! Limit between-meal snacks. When your child does snack, make sure it’s a healthy choice. Why go to all this trouble when these “baby” teeth are going to fall out anyway? We get this question a lot. Actually, the baby teeth are very important. They hold space for permanent teeth and are vital not only for eating, but for developing speech. The two bottom front teeth are the first baby teeth to appear, usually when your child is around six to eight months old. The four upper front teeth and the remainder will appear periodically in pairs along the jaw until your child is two-and-a-half years old. By the time your child is two-and-a-half, he or she should have all 20 teeth. The first permanent teeth will appear (“erupt”) between the ages of five and six. Don’t worry if your child’s teeth don’t exactly follow this timeline. Everyone is different and there may be some variations. If you have concerns, don’t hesitate to contact us.